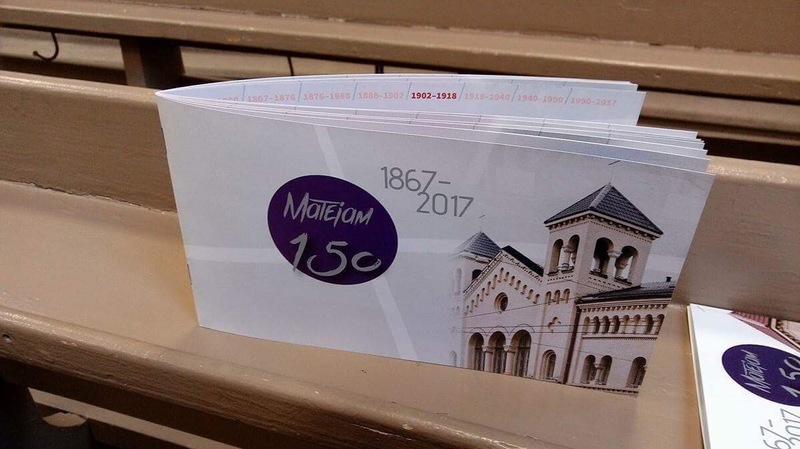 Today, Sunday October 22 and next Sunday, October 29 are the two Sundays set aside to Celebrate Matthews Church’s 150 years of serving God. We were so blessed to take part in all aspects of the celebration. We left for Matthews Church at 10:30 this morning set on an 11:00 arrival time for services that began at 11:30. As with the last two Saturday nights, once again the Celebration was filled with music. 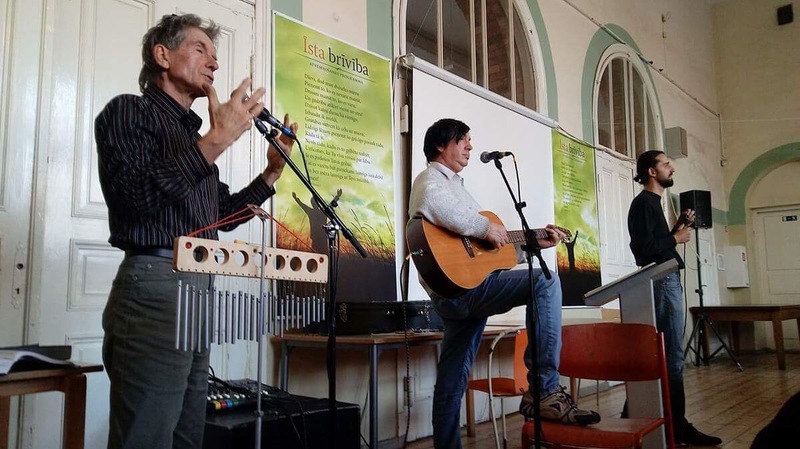 I don’t think it is possible to over emphasize how important music is to the Latvian heart. Add to that heart a soul that longs to praise God and musical expression becomes an overflowing fountain. Today’s service also overflowed with prayer as every ministry area of the church was prayed over during the celebration. During the service all ages were involved in praising God – even the littlest ones who sang “Jesus is my Friend”. 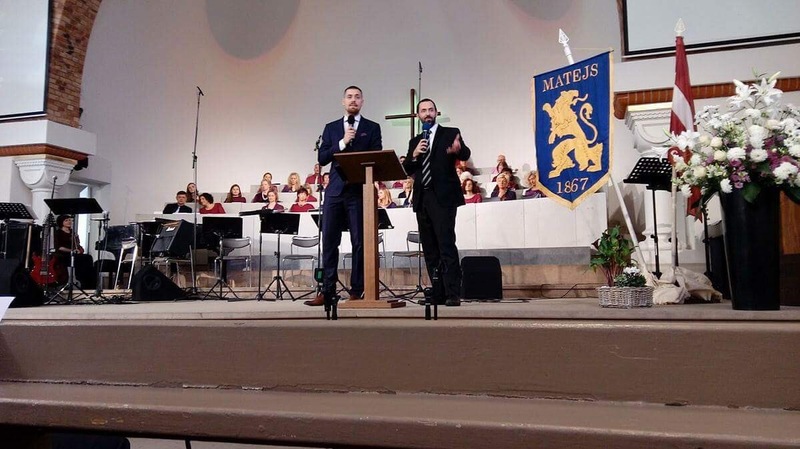 At one point in the service Pastor Mike brought greetings from Suburban and prayed scripture over Matthews Church. And then Pastor Scott from Evergreen Baptist Church, a second sister Church from Bixby, Oklahoma, also brought greetings. After the celebration concluded, the whole congregation, including us two sisters, squeezed onto the stage and a photograph was taken of everyone. And then, homemade Latvian cake for all! Those of you from Suburban may remember the Latvia Link Team talking about a timeline project to honor Matthews Church. 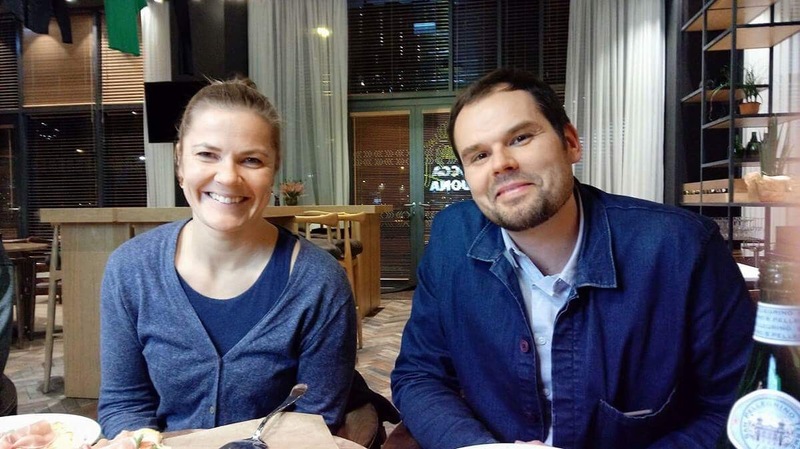 Erik Simmons visited Latvia in June to discuss the project and the idea shifted a bit to become a history booklet of Matthews Church. 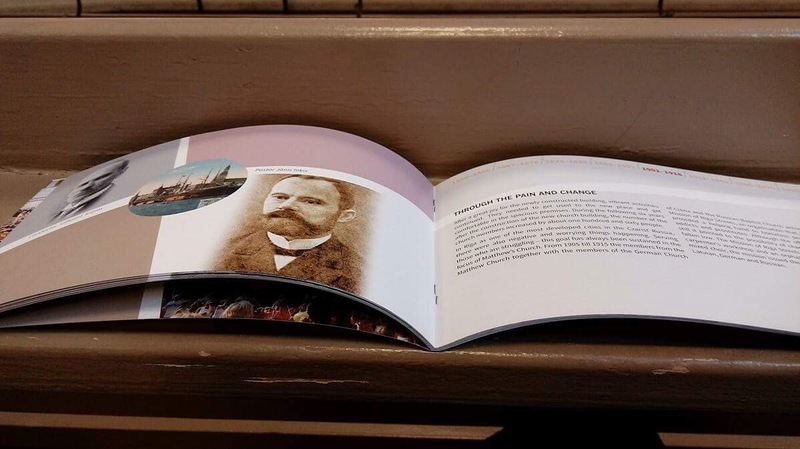 Today those history booklets were available in both English and Latvian. They are a beautiful reminder of God’s hand in the history of the church. Matthews gave both Sister Churches a gift too! 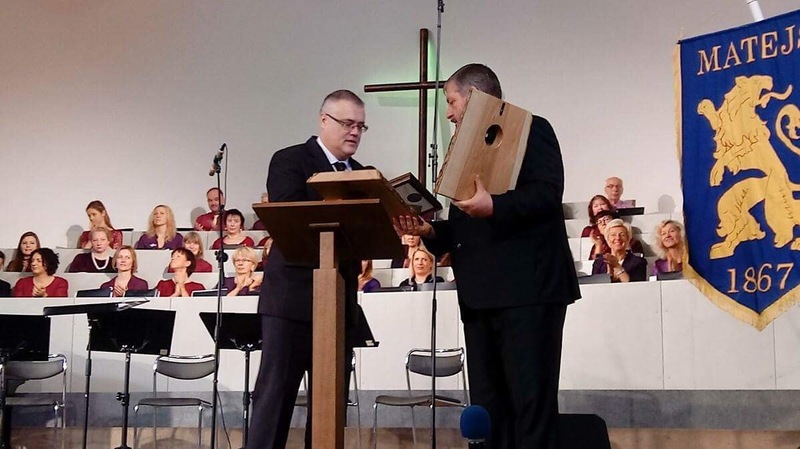 We each took home a beautiful wooden clock made from the heart of a tree from Latvia’s forest and a plaque celebrating our friendship and partnership with Matthews Church. 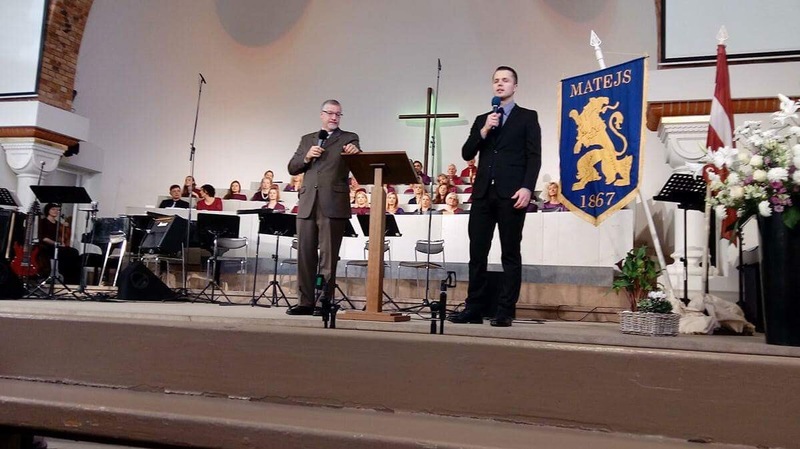 Each Pastor’s wife present was given a beautiful bouquet of flowers — another language of the Latvian heart. After the congregational photograph and a piece of cake we climbed a couple of flights of stairs to “The Least of These” service. Today around 150 people came to worship, hear the Gospel preached, and to receive the blessing of a small portion of food. These people are in hard times – some are homeless, some struggle with addictions, all are in reduced circumstances. Steve was surprised by a request to share a word with them, but the Holy Spirit was not surprised as Steve shared from his quiet time this morning. It was perfect — the story of Nicodemus, a man who thought he had everything, but found he had nothing without Jesus. As Steve said, Nicodemus’ story is Steve’s story, and my story and the story of each and everyone of us until we decide to give ourselves to following Jesus body, mind, and soul. As Steve shared I stood beside him and prayed over these men and women God loves so much. And then at the end of the service we were privileged to help distribute food and bless each person in the name of Jesus. It felt like a holy communion – a sharing of the word of life and the bread of life all in the name of the One who died for us. I praise God for Janis Neiders, the far man in the picture below, and his tenacious devotion to this ministry. 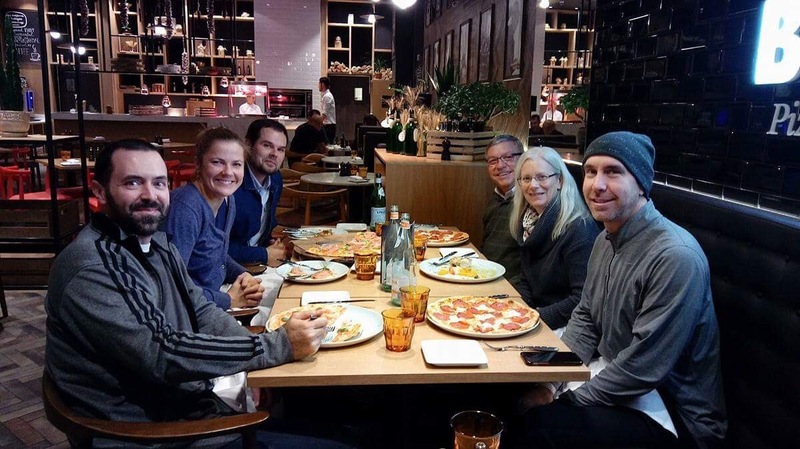 Pizza and Friends — a great combination! Our day was non-stop from 10:30 to 8:30 and it was all good! 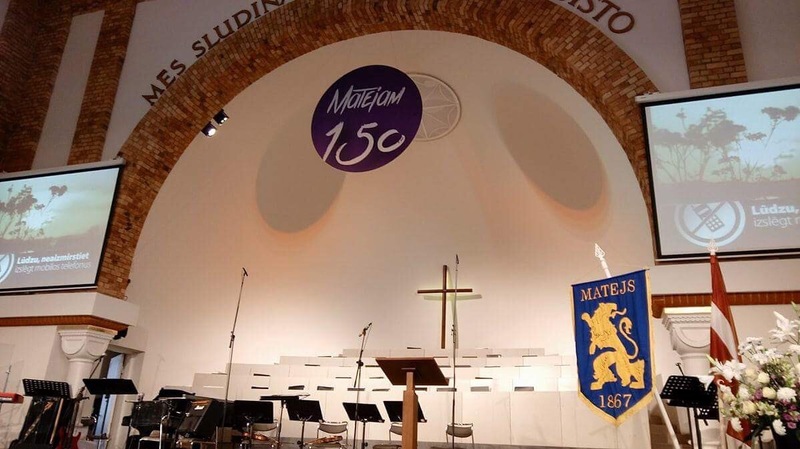 We look forward to tomorrow, connecting with Hardijs Rosenfelds, Chairman of the Board for Matthews, and learning a bit about Latvian history.